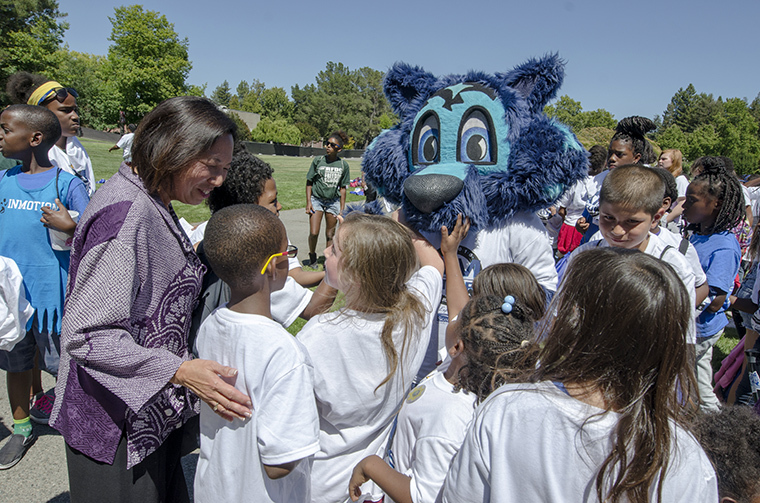 Sonoma State University hosted the largest visiting group of young children in the school's history on July 22 when President Judy K. Sakaki welcomed more than 400 elementary and middle school students from the Roberts Family Development Center (RFDC) in Sacramento to the University to experience a taste of college life. The RFDC is located in an ethnically diverse, economically challenged area of North Sacramento, serving families in that area. Most of the children in the program are African American. At the morning welcome session in the Student Center ballroom, Sakaki received a choreographed welcome of her own when the students loudly performed a "good morning" chant in English and Spanish. She then received applause when she told the group she grew up in East Oakland. "How many of you are going to college?" she asked. Every hand in the ballroom shot up immediately. "Wonderful," she replied. "Education is something nobody can ever take from you." Students were given "I Am the Future" T-Shirts, and participated in various activities throughout the day with faculty members and volunteers. Lunch was served in The Kitchens, the student cafeteria in the Student Center. "We are starting a foundation of a college-going culture with these first-generation college students," says Gina Geck, director of student outreach and recruitment. "We are introducing them to Sonoma State, but also to the importance of going to college in general." Local leaders in the African American community were invited as well, including Bill Clarke (President, 100 Black Men of Sonoma County), Rev. Sam Tharpe (Shiloh Baptist Church, Rohnert Park), Honor Jackson (retired NFL player) and many others. RFDC provides summer, after-school and Saturday recreation for many neighborhood youth. It is unique in that parents and children are paired together using literacy as a way to improve parenting skills and family communication. All services are provided on-site and enhance and complement existing services and programs within the community. The 15-year-old program received the FBI Director's Community Leadership Award at a ceremony in Washington D.C. earlier this year.